Every time you start PowerPoint 2013, you are automatically provided with a blank presentation theme. The default font of this blank presentation theme is Calibri. You can change this font according to your preferences by following a series of steps. First, switch to the VIEW tab and click on the Slide Master button. In the Slide Master view, you will see thumbnail versions of all the different slide templates in the left pane. Click on the first slide thumbnail. Making changes to this slide template will affect every template, which saves you from having to change each of them individually. To change the font of the text boxes, select the Font drop-down menu located under the HOME tab. When you are finished, click on the SLIDE MASTER tab and select Close Master View. Now, click on the FILE tab and select Save As. 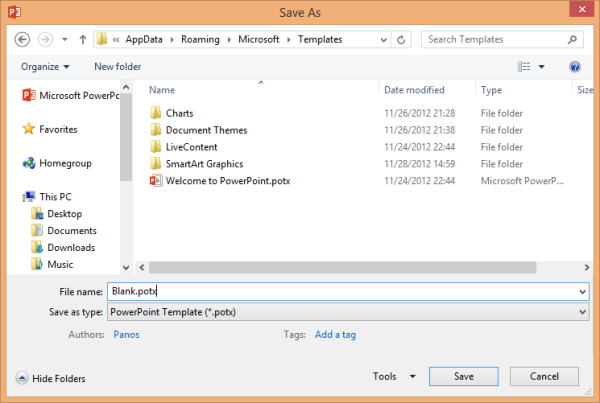 In the dialog box that appears, select Save as type and choose PowerPoint Template (*.potx). Navigate to the C:\Users\\AppData\Roaming\Microsoft\Templates folder (substitute with your Windows username). In the File name text box, type Blank. The file name MUST be Blank in order for the presentation to become the default start-up template. Click Save. Now, every time you open PowerPoint 2013 and choose FILE → New, your template appears as the first option in the Presentation Gallery. It will be labeled as the Default Theme and will include the previously configured font.